Less than twelve hours after finishing off a relentless scoring barrage that sent Celtic FC to their worst defeat ever in Champions League play, the winners of the match, FC Barcelona, were back out on the practice field for their habitual, post-game recovery workout. And as an added bonus, Wednesday morning’s feel-good session was complemented with a surprise visit from NBA All-Star Pau Gasol. The native of Sant Boi de Llobregat, a Barcelona suburb, watched on as Luis Enrique’s players jogged and stretched and posed for pictures. 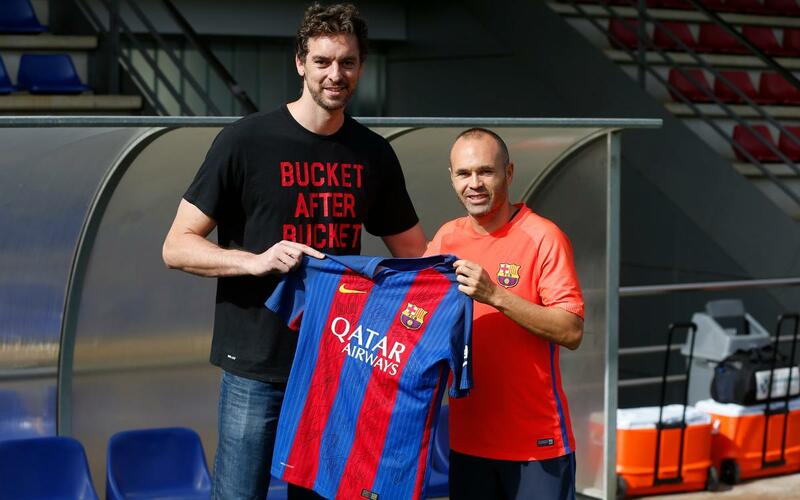 Gasol, now a member of the San Antonio Spurs, was on hand for the 7–0 victory at Camp Nou on Tuesday night — Barça’s biggest triumph ever in a Champions League game — when he was a guest of Club President Josep Maria Bartomeu in the Presidential Box at Camp Nou.